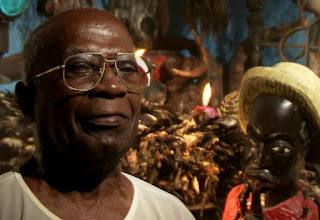 I Am Tata Nganga will be shown at Quad Cinema on Wednesday, April 18th, 2012 at 3:00pm as part of the 13th Havana Film Festival New York. Having had an opportunity to see the documentary I highly recommend it to anyone that appreciates Afro-Cuban culture, especially Palo. The 22 minute documentary is based on the life of Enrique Hernández Armenteros also known as “Enriquito de la Hata,” a 93 year old man that has dedicated close to 6 decades of his life to Palo, has over 2000 godchildren, and founder of the procession of San Lazaro el Milagroso. The film is not only one of the few positive depictions of Palo currently available that is tastefully and professionally done but also a treasure for those who value the insight of a generation that is sadly disappearing.